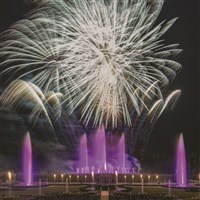 Join Perkiomen Tours for a day of wonder at Longwood Gardens in Kennett Square, Pennsylvania for one of their exciting Fireworks & Fountains Shows. Longwood Gardens Main Fountain Garden is revitalized and its 1,700 streams are ready to dance! For an extra special evening, come take in the stunning spectacle during Longwood's Fireworks and Fountains Show. The entire family will enjoy this light and sound spectacular, a summer tradition, at the internationally celebrated gardens. This event typically attracts approximately 5,000 people. Fireworks have been used at Longwood since at least 1907, the year after du Pont purchased the property. These extravaganzas combine lavish fireworks, stirring music and the celebrated colorful illuminated fountains of the 1,050-acre horticultural showplace. The result is an unforgettable display that lights the evening sky with magic and wonder. Along with free time to appreciate all that Longwood Gardens has to offer, you will also marvel at the Fireworks and Fountains Show which is operated by carefully synchronized computer programs, and music chosen to complement the displays. Motorcoach seating is assigned at the time of reservation but can not be guaranteed. Although we do our best to keep each traveler in the seat assigned at the time of reservation, there are times that it is necessary to move seat locations. Please be sure to verify your final seat number(s) with your driver at the time of boarding.